With such hectic morning weekdays, you'd think we'd be glad to take it easy and relax on the weekends. But no, we had to be the family with the daughter who takes skating lessons, whose class had to be on Saturday mornings at 8:45. So we have to be out of the house by 8:20. Saturday mornings have become an extension of weekday mornings where I put on my drill sergeant hat and get everyone up and running on a bowl of cereal, milk and fruit. Good thing they love it, huh? But Sundays are sacred. As the song goes, Never Never on a Sunday, a Sunday, a Sunday, 'cause that's my day of rest. Sundays are meant to be savored, and that includes breakfast. Actually, most Sundays the family still has cereal and milk, but if the kids ask for made-from-scratch oatmeal or waffles, instead of giving them an Are You Kidding Me?? look, I'll smile sweetly and say, Of course, honey. 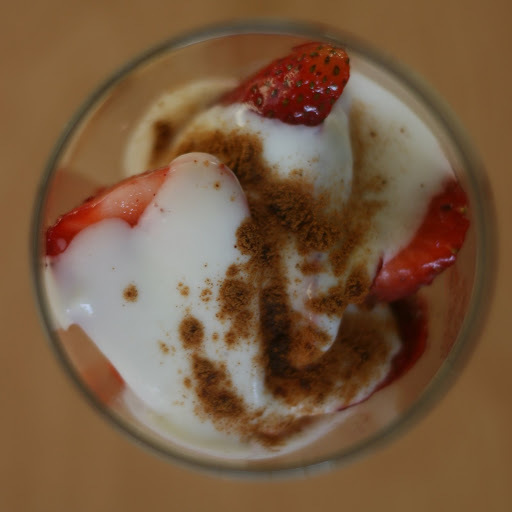 So on Sundays, they get sliced fresh strawberries swirled into vanilla yogurt, sprinkled with cinnamon and granola. 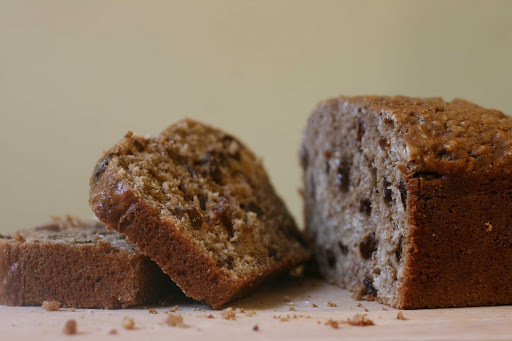 Or they might get the banana oatmeal bread that I baked the night before, smeared with butter and jam. Click here to see what else my family eats on weekend mornings -- and enter to win a $100 Visa gift card! Here's a great chance to win some extra cash for the holiday season -- and who doesn't need extra shopping money? Take the Lands' End/Every Day with Rachael Ray 2010 Holiday Survey at http://www.surveymonkey.com/s/landsendrachaelrayholiday2010 .Participants who complete the survey by 11:59 p.m. EDT on Tuesday, October 5th will be entered into a drawing for one of ten $50 Lands' End gift cards and the Rachael Ray cookbook, "Rachael Ray's Book of 10". Winners will be selected at random and will be notified on or around the week of October 25, 2010. Disclosure: By posting this information I get an extra entry into the Lands' End gift card drawing. Information is provided by the featured company/product and is clearly indicated as such. The views and opinions expressed here are my own. I was told that Fall is a special time at the Disneyland Resort, and now I know first-hand that it's true. Disney works their magic on Disneyland to transform it into a pumpkin-filled, haunted paradise, with special decor and attractions themed to the season. You can click here for a detailed description of the decorations, events and attractions that the Disneyland Resort offers during the fall -- but if you'd rather not read a press release and find out what I saw and heard, keep reading! * Even before you enter the park, you know it's Halloween Time at Disneyland. 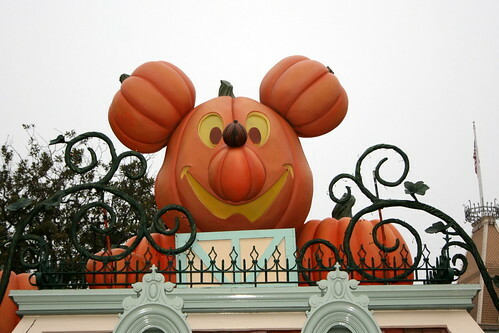 Check out this gigantic pumpkin Mickey! * Main Street, U.S.A. in Disneyland is all dressed up for fall, with over 300 pumpkins displayed in shop windows and on balconies. Look closely, because no two are the same. 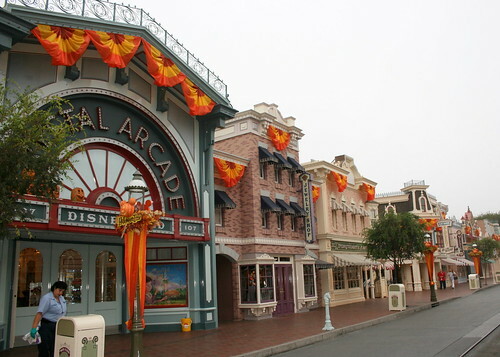 The buildings are festooned in orange and yellow bunting, and each lamp post has a Mickey pumpkin arrangement. It's absolutely gorgeous! 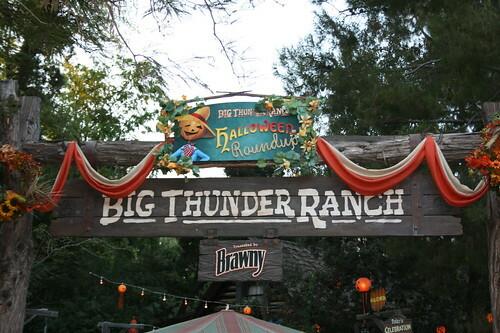 * Big Thunder Ranch looks like an autumn wonderland, all decked out in all the beautiful colors of fall. The stage is filled with pumpkins, vines and fall leaves, and there are scarecrows and jack-o-lanterns galore. * Special Halloween characters and Disney villains have come out for Halloween! There was a mob around Jack Skellington and Sally at New Orleans Square, and we saw guests lining up near It's a Small World in Fantasyland for Malificent and Jafar. And at the mom blogger event we had a special treat: we got to meet Cruela de Vil and Snow White's Evil Stepmother! 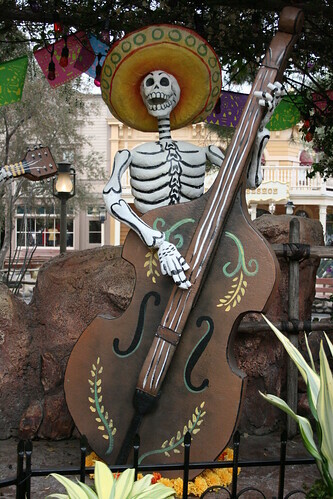 * Rancho del Zocalo in Frontierland is decorated with traditional skeleton figures in honor of Dia de los Muertos/Day of the Dead; they'll be on display until Nov. 2. * Look for Halloween treats around the park, including Zero's Ghostly Ghoulash and Halloween-themed rice krispie treats! I was hoping there would be Halloween-themed napkins similar to the holiday ones, but I'll have to be content with paper popcorn boxes with Halloween prints. 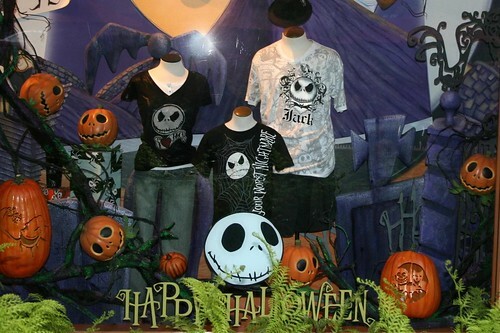 * Shops throughout the Disneyland Resort are selling Halloween-themed merchandise, from jack-o-lantern mouse ears to Halloween costumes to trick-or-treat bags to Halloween-themed pins, shirts and hats. 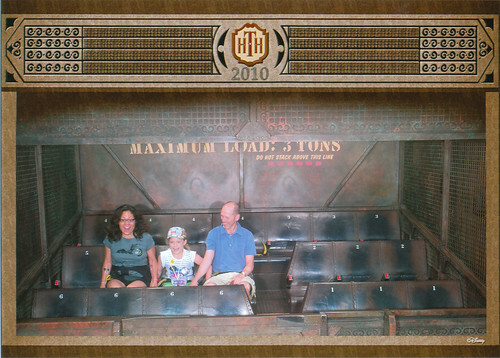 * The Twilight Zone™ Tower of Terror at Disney California Adventure (DCA) park offers spooky fun any time of the year. We had an unexpected surprise when our family was chosen to open DCA on Sept. 19, which meant we got an elevator ride on the Tower of Terror all to ourselves! 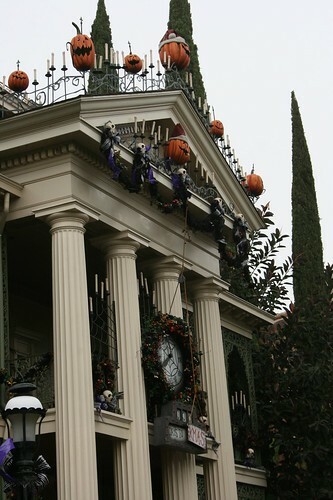 * The Haunted Mansion has been decorated for Halloween/Christmas, inspired by The Nightmare before Christmas (where the 2 holidays collide). I haven't been to the Haunted Mansion in about 15 years, and I've never experienced Haunted Mansion Holiday, and the rest of my family has never been to the Haunted Mansion at all --so it was an amazing experience. The decorations outside the mansion are gorgeous. Every aspect of the Haunted Mansion ride has been redone, from the ghostly holiday portraits to the Santa hats on all the ghosts to the music to the gingerbread haunted house display in the haunted party ballroom to the holiday ghouls that travel home with you on the way out. I think we might be spoiled now for the regular Haunted Mansion. How can anything be as spectacular as this? 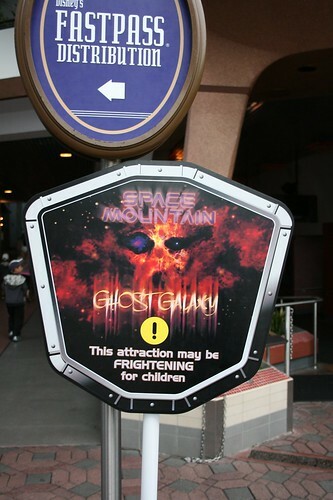 * Space Mountain has been themed for Halloween with images of spooky ghosts projected alongside the stars and comets that you see on the ride. My favorite one is the 3D-like projection of a ghostly hand that reaches out to grab you, just before the track dips down, so it feels like the hand just missed you. And there's a creepy eyeball that seems to follow your every move. It's so much fun! Parents of younger kids, beware -- this one really might be scary to them. Jammy has ridden Space Mountain many times, but after 1 ride on Space Mountain Ghost Galaxy, he freaked out at the ghosts and refused to ride it again (he says he'll go back when the ghosts are taken out of the ride). Halloween Time at Disney is truly a remarkable experience, and with the cool weather and smaller crowds, it just might be the best time of the year to visit. Catch the magic now before it goes away! 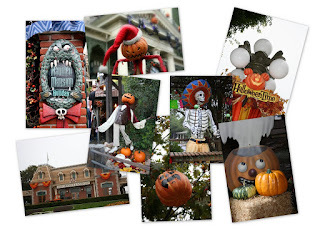 For more photos of the Disneyland Resort in the fall, go to my Halloween Time Flickr photo set! 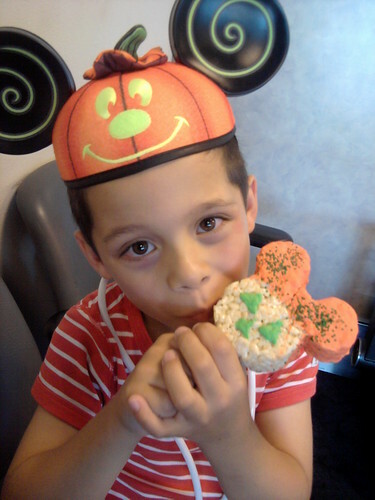 Disclosure: Disney covered travel expenses for me and my family to experience Halloween Time at the Disneyland Resort. The views and opinions expressed here are my own. 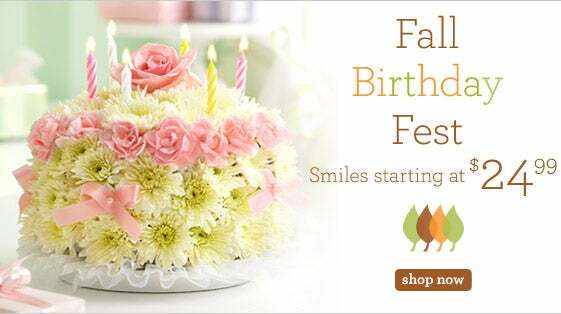 * Surprise your favorite October birthday boy or girl with a birthday floral arrangement from 1-800-Flowers.com. 1-800-Flowers has dozens of ways to Deliver Birthday Smiles -- take this gorgeous pastel birthday cake, for example. It's sweet and delectable, and it doesn't even have any calories. * Celebrate the most celebrated birthday of the year on October 5 with a Virtual October Birthday Bash on the 1-800-Flowers.com Facebook Page. And if you're in Manhattan on October 5, watch out for the 1-800-Flowers.com birthday float! Check out the 1-800-Flowers Facebook page to RSVP and get more details. * You can also follow @1800flowers on Twitter to stay abreast of the latest holidays, get fun flower trivia, and learn about birthday celebrations in your area for the month of October. Watch out for my next 1-800-Flowers.com post -- I'll be reviewing one of their birthday bouquets and hosting a giveaway so one lucky winner can also enjoy something from 1-800-Flowers.com! Disclosure: I was not paid for this post. I will be receiving a floral arrangement from 1-800-Flowers.com for a future review, as well as a gift code to offer in a future giveaway. Product information is provided by the featured company/product and is clearly indicated as such. The views and opinions expressed here are my own. Olivia has always been one of my favorite modern children's characters. She's quite a character -- spirited, yet sweet, with an imagination that literally transforms her world and sends her up and away into worlds of fantasy. And each book is like a work of art -- I think Ian Falconer's delicate, retro illustrations are so refreshing in a world of garish cartoon figures. Maintaining that fresh, delicate look is difficult when it comes to merchandising; plastic figurines and playsets are hardly the medium for conveying Olivia's spirit -- but Team Mom recently sent me a couple of toys from Spinmaster's new Olivia toy line, and I have to say, I'm pleasantly surprised at how these toys remain true to the Olivia books. 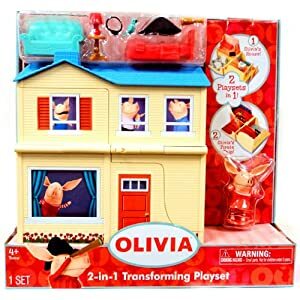 Olivia's 2-in-1 Transforming Playset is a mini dollhouse that transforms into a pirate ship so kids can help Olivia take off on one of her imaginative adventures. 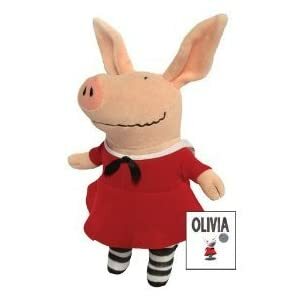 * A figurine of Olivia's little brother Ian (a small Olivia figurine is included). The Olivia Everyday Doll features our heroine dressed in the red-striped shirt and red coveralls we all know and love. 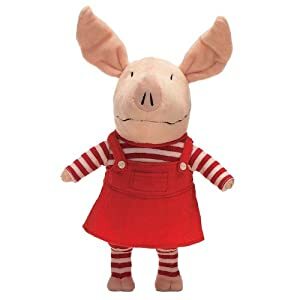 There's nothing to fault with this 8" doll; it's simple and sweet and cuddly and totally lovable, just the right size to take along in the car or in a backpack. If only there were outfits and accessories available for sale, so that kids could change Olivia's clothes. Oh well, I guess they'll just have to use their imagination -- and isn't that what Olivia is all about anyway!? Thanks, Team Mom, for sending us such adorable toys to review! 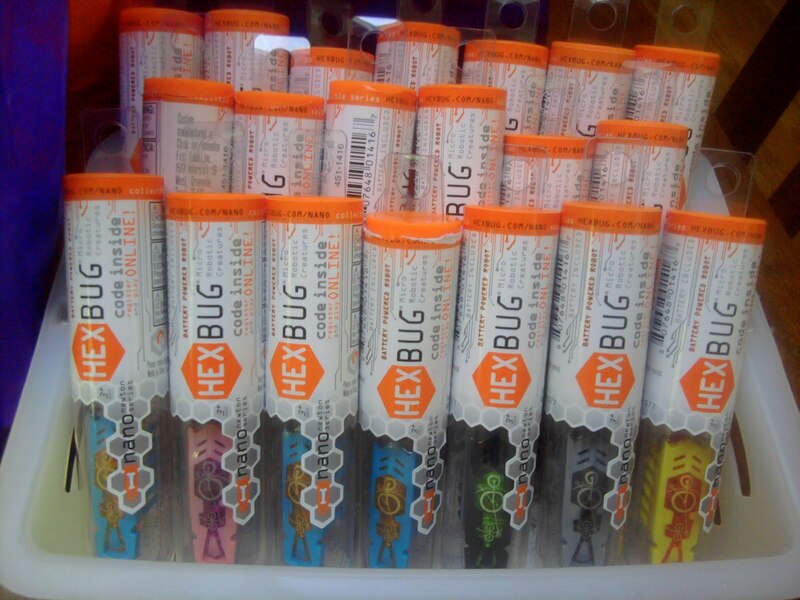 Something small is making big news in the toy world: Hexbug Nanos! 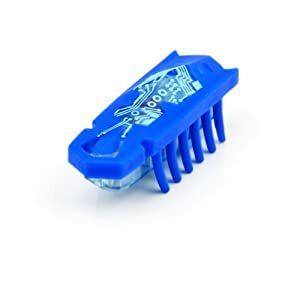 You wouldn't think that such a small, simple toy could offer so many possibilities for play, but these vibrating bugs seem to be all the rage. I've seen them at retail outlets like Target or Walmart, in individual test tube packs or as part of a bigger set containing bug(s) and habitat pieces. And when MomSelect gave us the opportunity to host a Hexbug Nano party for 3Po and Jammy and their friends, some of the boys we invited already knew about Hexbugs and how much fun they were. Mother Nature meets micro-robotics with Hexbug Nano. Designed to look and behave like a real bug, Nano is actually a very cool little robot that uses the physics of vibration to propel itself along and explore its environment. It runs, it skitters in all directions, it flips over and then pops back on its feet. There s no telling what Nano will do next! Real fun with real science. Let your Nano run free or build a special Nano habitat (sold separately) with a whole family of Nanos. Start a Nano nation! The possibilities are endless and so is the fun. Visit the Hexbug website to register and track your Nano, play games with other collectors, download photos and learn more about robotic science. Nanos measure approx. 1+" long, with batteries included. Nano uses 1 AG13 button cell battery (sold separately for $3). 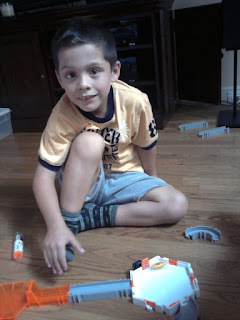 Each child received three Hexbug Nanos and a spare battery at the party; MomSelect sent along so many habitat pieces that I sent each child home with an assortment of hexagonal arenas, straight ramps and curved ramps so they could continue their play at home. The kids went buggy for these little bugs! It's always good when the first word out of their mouths when they see a toy is, "Coooooool". There was a mad scramble for each to get their favorite colors (that's another fun thing about Hexbugs: you can collect and trade them), then it was off to build the most complicated Hexbug Nano maze ever. I think they must have spent a full hour configuring and re-configuring their Hexbug system of hexagonal arenas, straight ramps and curved ramps. It's super-easy to snap the pieces together and take them apart, so the kids didn't need any help from me. MomSelect even provided us with a Bridge Battle Habitat Set containing inclined ramps and bridges and risers, so the kids were able to make a multi-level maze for the Hexbugs to travel through! The Hexbugs travel by vibration, so no two will travel the same path. The kids can put obstacles such as barricades and one-way doors to make things more interesting. We played lots of fun games with the bugs and tracks! We held timed races, where each child chose a bug and let it loose through the Hexbug labyrinth, competing to see whose bug took the least time to get from Point A to Point B. Because of the random nature of their motion, some bugs never even made it! We tried relay races and push-a-pebble races and every kind of race you can think of. I love the fact that you can break the habitat into small pieces, which means you can just dump them into a big plastic bin and store it away, nice and neat, all ready for the next playdate. The whole Hexbug Nano habitat play system combines the best elements of a construction playset, a race car set, a battle arena, an online game and a collector's item. 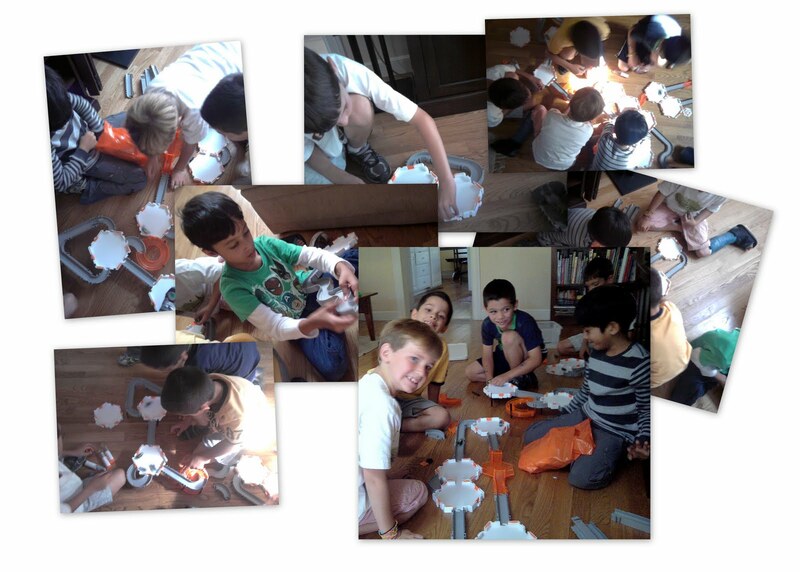 Everyone had a wonderful time building and racing and battling and having lots of little-boy fun. They've even given their bugs names and are now thinking of building little egg-carton condos for their bugs to live in. See, more creative play possibilities. Thanks, MomSelect, for introducing us to yet another fun toy! 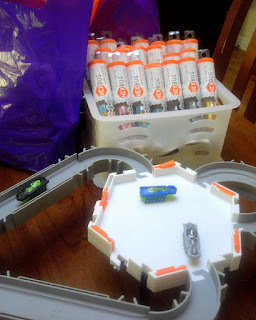 Disclosure: I received a HEXBUG Nanon in-home party kit courtesy of MomSelect and Hexbug in order to host this party. Product information is provided by the featured company/product and is clearly indicated as such. I did not receive any monetary compensation for this post. The views and opinions expressed here are my own. Ever since I was a little girl, I've associated the Welch's brand with real fruit and good nutrition. We love Welch's juices, jellies and jams, and any day that I give the kids Welch's Fruit Snacks is a happy day for them. We recently received a few samples of Welch's Fruit to Snacks to review -- and you can bet that was a happy day! Welch’s Fruit Snacks are chewy snack made with real fruit and fruit juices. They are come in nine varieties: Mixed Fruit, Berries 'n Cherries, Island Fruits, Strawberry, Fruit Punch, Concord Grape, White Grape Raspberry, White Grape Peach and Reduced Sugar, which has 35% less sugar than other Welch’s Fruit Snacks varieties. With school back in full swing, Welch’s Fruit Snacks are the perfect fat free and Gluten free food that you can feel good about putting in your kids lunchboxes. For kids with allergies, or who are in classrooms with kids who have allergies, Welch's are also a wonderful nut-free and dairy-free snack. They're made with real fruit and real fruit juice, packed with vitamins A, C, and E and have no preservatives. Welch's Fruit Snacks are available in a wide range of flavors, as well as a reduced sugar version containing 35% less sugar. We were given samples of the Island Fruits and Reduced Sugar versions of Welch's Fruit Snacks, and my kids went crazy for them! They love Welch's Fruit Snacks, and the Island Fruits flavor made a nice change from the usual berry-based flavors. I like the Reduced Sugar version the best, because it's got less sugar than other varieties, yet still tastes as good. It's a great option when I want to give my kids fruit snacks! I'm happy they have a reduced sugar version, but even though these fruit snacks contain real fruit juice concentrate and fruit puree, corn syrup is still a main ingredient, which for me keeps it in the candy category -- which means they are great for occasional treats, not regular lunchbox material. I wish they would make a 100% fruit version (i.e. dried fruit snacks) to round out their offerings! Welch's Fruit Snacks are a yummy treat for kids! You could win free lunch for a year in Welch's "Lunchbox Notes" contest! One grand-prize winner will receive cash for groceries to buy lunch for one year (ARV $1,000) and a one-year supply of Welch’s® Fruit Snacks (ARV $160). Ten runners-up will each win a gift certificate to a fun, family restaurant of their choice (ARV $100 each) and a one-month supply of Welch’s® Fruit Snacks (ARV$12.00). Disclosure: I received product samples from Welch's, but was not paid to review the product or give my opinions. Product information is provided by the featured company/product and is clearly indicated as such. The views and opinions expressed here are my own. 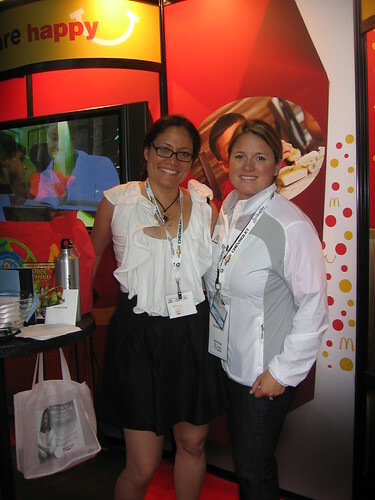 Having been a guest at the McDonald's Family Time Getaway in June, I felt almost like an insider when I stopped by the McDonald's booth at BlogHer 2010. Not only did I already know some of the people manning the booth, they were also handing out samples of the new McDonald's menu items we had tasted at the McDonald's campus. I actually ditched the official BlogHer breakfast in favor of the McDonald's booth because they were serving up samples of their heavenly new oatmeal. As far as I know, McDonald's Oatmeal is still limited to test markets around the country (I actually saw a sign advertising them in Santa Cruz over Labor Day weekend). I really hope this product does well enough to be sold nationally because I can totally see myself dropping by McDonald's on a regular basis for that oatmeal. We were told about the new Angus Snack Wraps at the Family Time Getaway Weekend, but I didn't get a chance to taste them until the CheeseBurgHer Party at BlogHer. 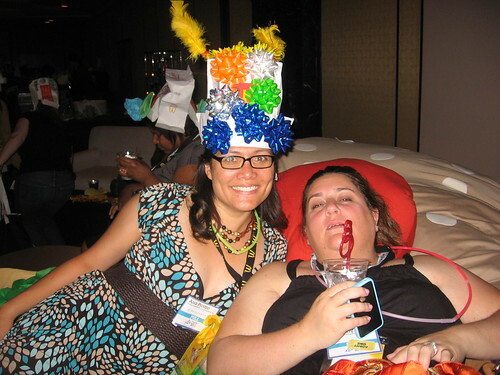 Not only did we get to wear silly bag hats, ham it up with friends in photo booths, and lounge around on giant hamburger sofas, we also got to taste Angus Snack Wraps, which are like hamburgers wrapped in a tortilla instead of on a bun. After the event, McDonald's even sent me extra coupons for free Angus Snack Wraps, so I've been able to try all three flavors. My favorite by far is the Bacon & Cheese, because adding bacon and cheese to anything makes it taste even better! I didn't care for the Mushroom & Swiss, but I also liked the Deluxe variety because it has tomatoes and lettuce. Having just a tortilla instead of a bun makes it a lot lighter on your stomach, but it's still enough for a meal if you pair it with a small side salad, or better yet, a small McDonald's French Fries. Now you can get a chance to try the Angus Snack Wrap too -- three lucky Bonggamom Finds winners will each receive a coupon good for one free Angus Snack Wrap! Leave a comment on this post and tell me which variety of the new Angus Snack Wrap you would most like to try (Mushroom & Swiss, Deluxe, or Bacon & Cheese). This entry must be completed before extra entries qualify. 3) Write this on the Bonggamom Finds Facebook page telling me which McDonald's menu item is your favorite (1 entry). This giveaway ends at 11:59PM PST on October 10, 2010; I will draw 3 winners at random on October 11 and post the names after the winners confirm acceptance. US addresses only. Coupon expires December 31, 2010. For additional giveaway rules, click here. Good luck! Disclosure: I received coupons for free McDonald's products, but was not paid to review the product or give my opinions. The views and opinions expressed here are my own. One of the highlights of my blogging adventures last year was getting to donate Leapfrog Tag reading kits to several schools around Silicon Valley. It was so heartwarming to know that kids, especially underprivileged kids whose first language may not even be English, were using the Tag to get their reading skills up to grade level. And ever since I found out that many teachers actually have to spend their own money on school supplies, I have embraced any cause that helps deserving teachers get the teaching tools they need. LeapFrog has donated $100,000 to DonorsChoose.org, to match donations, dollar-for-dollar, made to teachers who request the Tag learn-to-read system for their classrooms. So if you donate via DonorsChoose.org to the teachers on this list, Leapfrog will effectively double your donation! Note: Don't forget, if you're a teacher, you can post a request for Tag Readers and Tag books -- or if you know a teacher, encourage them to post a request -- and make sure to reference “LeapFrog Tag Readers” in the request! I know, times are hard. But LeapFrog is offering a way for people to help, even if they can't contribute financially. They're hosting a "Virtual Book Drive" on Facebook -- for each new Facebook fan they get, they will donate a Tag book to a Kindergarten teacher. Yup, all you have to do is "Like" Leapfrog on Facebook, and they'll donate a Tag book. If you spread the word and your great-aunt Fanny "Likes" Leapfrog on Facebook, they'll donate another Tag book. Now aren't you glad you decided to friend your great-aunt Fanny? You haven't heard the last from me about Tag. Give. Read. I'm happy to announce that Leapfrog will be providing me with a LeapFrog Tag classroom kit to donate to a deserving kindergarten class -- so watch out for posts about which class I chose, and how they like it! And to help drum up even more interest and support, I'll be hosting a giveaway for a Tag Reading System for one lucky Bonggamom Finds reader and a Tag classroom kit for the kindergarten class of the winner's choice! Thanks in advance for your support of this great program! Disclosure: Leapfrog will be providing me with a Leapfrog Tag classroom kit to donate to the kindergarten class of my choice. I did not receive any samples for personal use or monetary compensation for this post. Product information is provided by the featured company/product and is clearly indicated as such. The views and opinions expressed here are my own. Guess what -- it's the first anniversay of Bonggamom's Friday Finds! I can't believe it has been one whole year since I started sharing this linky with everyone. I posted my first giveaway roundup on September 24, 2009 and forty-one kind souls took pity on me and left links that day. The number of links has dwindled to as few as eight in a week, and is now in the hundreds! That's hundreds of great giveaways to join! Thanks so everyone who has been contributing to this linky, as well as everyone who has been using the linky. I'm glad it has been useful to everyone involved. As always, feel free to leave links to your giveaways, as well as enter giveaways. Here's to another year of The Bestest Giveaways Around the Blogosphere! My review blog, Bonggamom Finds, is today's Featured Blog on Audrey's Giveaways, a popular review and giveaway blog. 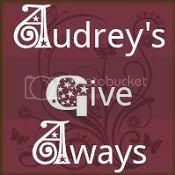 Audrey was kind enough to include my blog button and links to a couple of my ongoing giveaways. Thanks, Audrey, for the linky love! I hope you get lots of good karma for doing this! After my last 2 K'nex reviews , I figure you guys all know by now that we're huge K'nex fans. You can read. You get it. We love K'nex. In case you wondered, yes, The Pea loves K'nex too. Here's her latest creation: a Drop Zone tower for her Zhu Zhu Baby pets, complete with turnstile, safety cage and guard rails. How can you not love it? I can't help it. I'll happily welcome more of the same K'nex we know and love, but this is all-new stuff. I've realized that there's a big hole in our K'nex collection, and these new sets have filled the void! K'nex has really opened up their product offerings by partnering with brands that kids know and love, to offer even more possibilities for character-based pretend play. 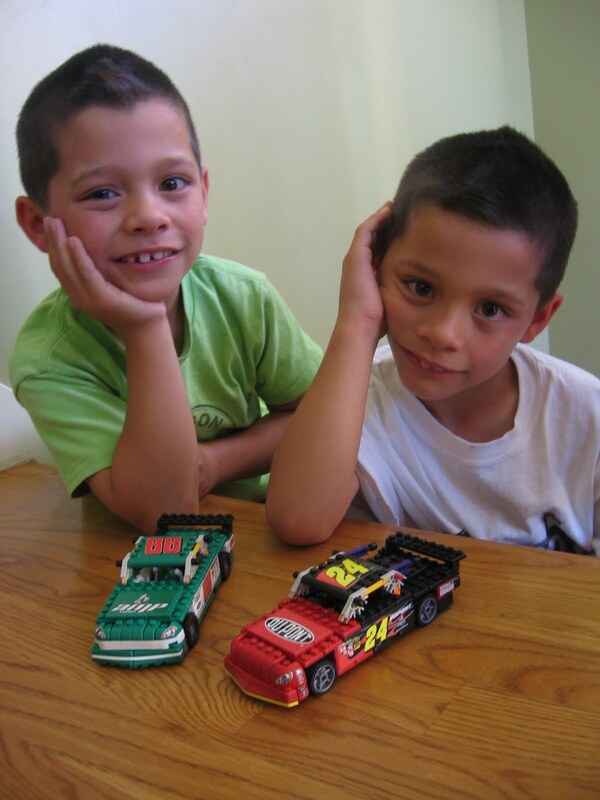 K'nex now has officially licensed NASCAR Building Sets, so kids can build and race their favorite racing cars, collect their favorite drivers and create an entire NASCAR® world. We received the 88 AMP Energy car, Office Max car and DuPont car. K'nex fans can build and customize their very own Orange County Chopper bikes, just like the ones on the hit TV show. We received the Raptor Bike building set. Specifically designed for kids ages 5-7, each Multi-model set centers around an exciting theme – Fire Rescue™, Hi-Flyers™, Revving Racers™ and Pirates – and includes super-cool new features such as a spring motor for movement and a K’NEXman figure! We received the Hi-Flyers set. The K’NEX 350 Piece Value Tub is filled with loads of pieces and even more possibilities. Young builders can bring ideas to life using their imagination or follow the directions to build 20 suggested models. Ideal for afternoons inside, the 350 Piece Value Tub encourages open-ended building and after building play. WOW. These new K'nex sets are so much fun! My boys' easy favorites were the NASCAR sets because they could race the cars after they built them. Each set has a tiny K'nex racecar driver figure representing the actual driver -- the 88 Amp car comes with Dale Jr., the DuPont car comes with Jeff Gordon, and the Office Max car comes with Tony Stewart, complete with stubble! The sets were challenging enough to keep them entertained, and they loved putting on the decals to make their cars look just like the actual NASCAR racing cars. The OCC bike was sleek and beautiful, with special engine and seat pieces, as well as fat-boy tires that gave it a distinctive Orange County Chopper look. They're too big for a mini-figure to ride on (too bad, it would have been funny to see Paul Sr. immortalized in a K'nex mini-figure!) but we now have one very lucky Transformer robot who has a sweet new set of wheels: his own K'nex OCC bike! The Multi-Model Hi-Flyer and 350-pc. Value Tub have been added to our humongous K'nex collection, and I say The More, The Merrier. I love how the Hi-Flyer has instructions for 10 different kinds of planes, so it never gets old! Playing with K'nex always puts a smile on my kids' faces. The only thing I don't like about these brick-based K'nex sets is that they're not as sturdy as regular K'nex -- the brick connections are not as secure, and they seem to break apart much more easily. I've said it once and I'll say it again: You can never have too many K'nex. It's a wonderful toy for any age and gender, and it will give your child hours of fun! Disclosure: I received product samples from K'nex, but was not paid to review the product or give my opinions. Product information is provided by the featured company and is clearly indicated as such. The views and opinions expressed here are my own. P.F. Chang's Home Menu Review and Giveaway. P.F. Chang's Home Menu frozen entrees serve 2 people and are available in 8 flavors -- Beef with Broccoli, Orange Chicken, General Chang's Chicken, Sweet & Sour Chicken, Shanghai Style Beef, Ginger Chicken & Broccoli, Shrimp in Garlic Sauce and Shrimp Lo Mein. They are available in your grocery's store's freezer section. With the introduction of new P.F. Chang's® Home Menu™, those who long for the signature Asian cuisine made famous by P.F. Chang's China Bistro® can now conquer their cravings at home. Created with the expert chefs at P.F. Chang's and produced and distributed by Unilever (NYSE: UL, UN), one of the world's largest consumer products companies, the P.F. Chang's Home Menu line includes eight premium frozen entrees with the bold flavors associated with P.F. Chang's. Inspired by P.F. Chang's best-selling recipes, the line includes: Orange Chicken, Shanghai Style Beef, Sweet & Sour Chicken, General Chang's Chicken, Ginger Chicken & Broccoli, Beef with Broccoli, Shrimp in a Garlic Sauce and Shrimp Lo Mein. The two-serving entrees, which are made with high-quality ingredients and feature signature P.F. Chang's flavors, are convenient and easy to prepare, going from skillet to a succulent high-quality meal at home in just minutes. A patented packaging technology keeps food fresh-tasting for a premium dining experience. 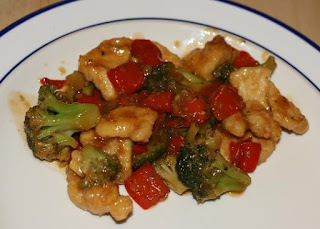 I used our coupon to get the General Chang's Chicken variety, and my family loved it! It's nice and flavorful, not bland at all, and certainly tastes like something you'd find at P.F. Chang's (note: the website says that these entrees are based on P.F. Chang recipes, not identical, so you won't get exactly the same taste as the dishes in the restaurant, but I thought they were delicious!). The broccoli was nice and crisp, and the chicken was flavorful and juicy. This is definitely something I'd buy again! We were definitely left wanting more -- not only because it was so yummy, but also because each package is meant to serve two people. I think it would serve two people quite generously. Given the quantity of food, I was happy to note that calorie count was decent for Chinese food. Most flavors were around 320 to 360 calories per serving, with the lowest one being 290 per serving for the Shrimp in Garlic Sauce, and the highest being 450 per serving for the Orange Chicken. I was disappointed to see the high sodium values on each and every one of the 8 varieties, ranging from 35% of recommended daily allowance to a whopping 60% of RDA for the Shrimp Lo Mein. Fat content was not as shocking, but still high; I thought the fried entrees like Oriange Chicken would have the highest fat content, but the "winner" was actually Beef with Broccoli at 18 grams of fat (and 3 grams of saturated fat) per serving. P.F. Chang's Home Menu frozen entrees are a great option when you want a yummy Chinese food meal at home, but don't have the time to cook -- or when you're craving the taste of P.F. Chang's, but don't have the money to book a table at the restaurant. Try P.F. Chang's Home Menu for Free! One lucky Bonggamom Finds reader will win a coupon good for one free P.F. Chang's Home Menu frozen entree for two. Leave a comment on this post and tell me what dish you always order when you eat at a Chinese restaurant. This entry must be completed before extra entries qualify. This giveaway ends at 11:59PM PST on October 10, 2010; I will draw a winner at random on October 11 and post the winner's name after the winner confirms acceptance. US addresses only. For additional giveaway rules, click here. Good luck! Disclosure: I received a coupon good for one free product sample, but was not paid to review the product or give my opinions. Product information is provided by the featured company/product and is clearly indicated as such. The views and opinions expressed here are my own. Get more out of what you currently have by rearranging your furniture: With a little elbow grease and a new point of view, rethinking your room layout can be the equivalent of a mini-makeover. Turn Something Old into Something New: Upcycling, or creating something new out of old material, makes a practical yet creative DIY project. Build Your Foundation – and layer with more color for a designer look: A fresh coat of paint can dramatically change a room without breaking the bank! Accent and Accessorize: Space-enhancing mirrors, soft rugs, ambient lamps, pillows, and plush throws add character and comfort to the home while reflecting a homeowner’s style. Transform your View: Switching out window treatments is one of the simplest ways to refresh the look and feel of a room, addressing functional benefits such as controlling light, privacy and temperature, while making a big visual impact. Bring the green indoors: Indoor plants are not only a great cure for the winter blues but also a great way to enhance your décor. Not to mention that they take in carbon dioxide and release oxygen into your home! Small Change, Big Impact: Swap out your hardware on your living room furniture - it can completely change the look and feel of the room. Thanks, Chip, for all your tips and suggestions! Disclosure: This interview was conducted as part of a blogger media tour sponsored by Levolor blinds. I did not receive a sample or monetary compensation for this post. Additional decorating tips (in italics) were provided by Chip Wade and MultiVu. The views and opinions expressed here are my own. 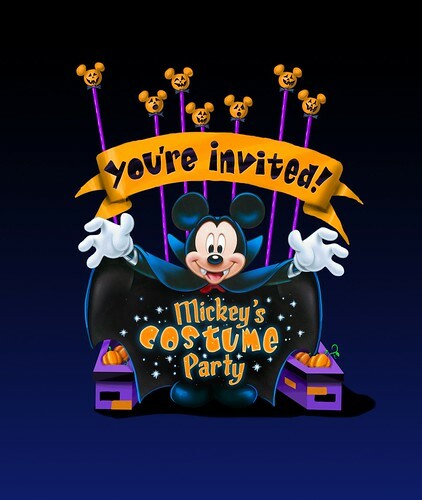 Moving to Disneyland this year with a new name, Mickey’s Halloween Party is a separate-ticket event that invites adults and children to dress up in costume and trick-or-treat at the resort. This nighttime celebration is scheduled for Tuesdays and Fridays in October (1, 5, 8, 12, 15, 19, 22, 26 and 29) plus Halloween night itself, Sunday, Oct. 31. As far as I'm concerned, October isn't complete without a Halloween party -- why should all the candy-strewn, freakishly-decorated, dress-up fun be limited to just one night? That's why I host a Halloween party every year. But there are Halloween parties, and then there are Halloween Parties. And then there are Disney Halloween Parties. Just as they do with everything else, Disney throws in a little bit of pixie dust into their parties to make them truly special, and that's the way it is with their annual Halloween party. 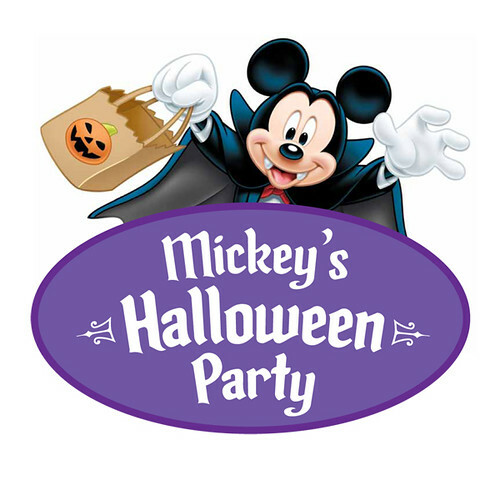 It's called Mickey's Halloween Party and it sounds like soooooo much fun! * Disneyland will close early to regular park guests on party nights (6:00PM on Tuesday nights, 7:00PM on Friday nights and Halloween night). After closing time, the park will be open exclusively to Mickey's Halloween Party guests -- and with far less people in the park, you'll be able to enjoy nearly all your favorite rides and attractions with shorter wait times! * Mickey's Halloween Party guests get to enter Disneyland Park 3 hours before park closing time (i.e. 3:00PM on Tuesday nights, 4:00PM on Friday nights and Halloween night) -- note, you don't have to buy a separate park admission ticket, just the Mickey's Halloween Party ticket! * This is one party where grownups don't have to feel silly about dressing up in costume. At the mom blogger presentation we saw great slides of families dressed as The Incredibles, the Toy Story cast, Jack Skellington and Sally, and more. Everyone is in costume, including the Disney characters! I can just imagine Winnie-the-Pooh dressed as a vampire! * There will be treat stations galore so kids can go trick-or-treating. Stations will have yummy candy treats as well as healthy snacks. 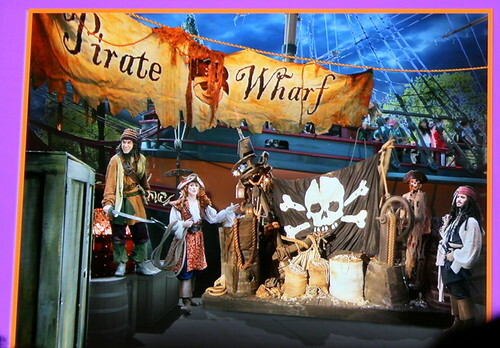 * Speaking of pirates, Jack Sparrow and his mates will be celebrating at the pirate party down at the French Market, where even landlubbers can dance jigs all night long. There's a second dance party at the Tomorrowland Terrace that I hear is out of this world, with humans and aliens all welcome. * Mickey and his pals will perform in "Mickey's Costume Party" cavalcade twice per night. This fun parade/show will have some great all-new surprises. * There's even a fireworks spectacular exclusively for Mickey's Halloween Party guests. It's hosted by --who else? -- Jack Skellington, the “Master of Scare-omonies”. 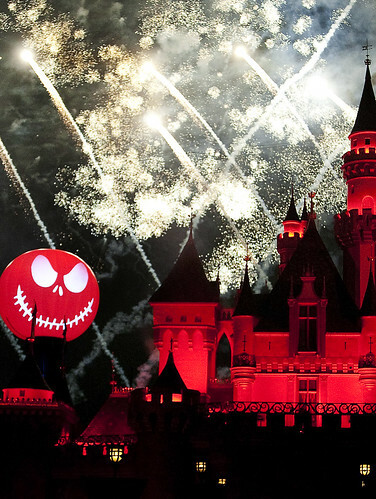 Stay tuned for more posts about Halloween Time at the Disneyland Resort! Disclosure: Disney covered travel expenses for me and my family to attend a mom blogger presentation about Mickey's Halloween Party and other fall attractions at the Disneyland Resort. Information is provided by the Disneyland Resort and is clearly indicated as such. The views and opinions expressed here are my own.